An email from my favorite singer/songwriter! And one bursting with gratitude at that! Suddenly, my day seemed much more approachable. I stretched and hopped out of bed, turning on Josh Ritter’s new release I had downloaded at midnight eastern time last night. As I brushed my teeth, I read his emailed note again and was truly blown away by all the gratitude he expressed. Sure, we could be cynical and say it’s a marketing ploy, but I’ve seen the man in concert several times and he looks like he would make the Top 10 Happiest People list. He manages to grin and sing at the same time. But in an effort to not sound too star struck, I’ll take him Josh himself out of the picture altogether. 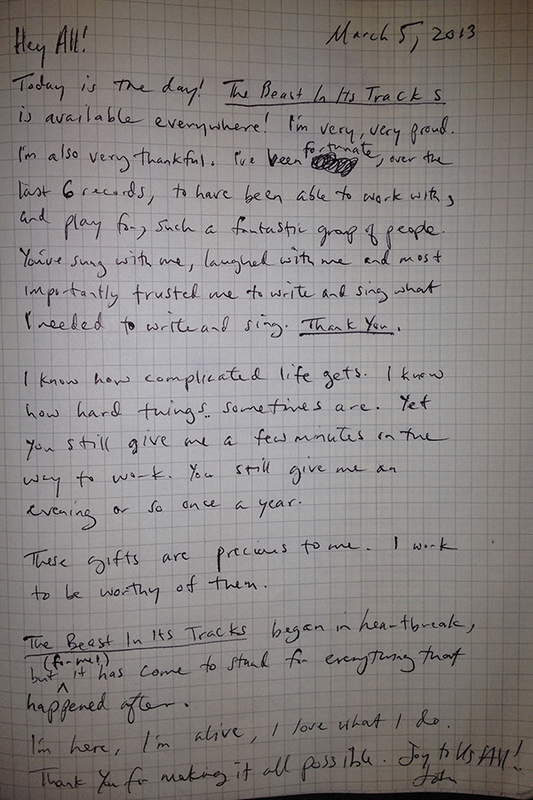 If we just analyze the text of his letter (sorry, the English major in me can’t resist), he is oozing gratitude. I mean, he thanks his fans for listening to his songs while they drive to work, for trusting “…me to write and sing what I needed to write and sing.” These aren’t big things he’s thanking his fans for, but he recognizes they all added up to one very big thing: a stellar album. Today, I made sure to thank everyone for the little things: for the cup of coffee, for the words of encouragement, for taking five minutes out of their day to mentor me. I thanked them all for this because someday, when all these little things have shaped me into a better person, I’ll want them to know that I am really and truly grateful. On that note, I’m grateful to all of you for reading my blog and for letting me gush over Josh Ritter a bit this evening – Joy to us all!